We had a wonderful time at the Long Beach, Calif., concert. We live in San Diego and left early that morning to visit some old haunts in the Long Beach area. We visited Long Beach Community College, where my wife and I met in 1956. We found the classroom where we met, and visited the gym and stadium, where I played football and my wife participated in all sports. Some very nice staff folks, after hearing our story, unlocked doors for us to see everything, including the band practice room, where I practiced with the band. We fi nished the tour when we found the same tree that I used to wait under for my wife to get out of science class. Great time wandering down memory lane. We then met my sister-in-law and her boyfriend near the arena and had an early dinner, then off to the concert. 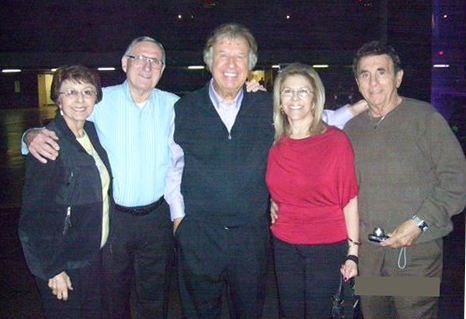 We had the great fortune to meet Bill Gaither backstage. He is just as relaxed and pleasant in person as he is on stage. He made us feel like family. He was running late, and Kevin Williams was already on stage warming up the audience, but Bill acted like he had all the time in the world to visit with us. Of course, the concert was simply wonderful. We were close enough to the stage to be able to study the faces of all of the performers, and I could tell that they all wanted to be there and share their love for our Lord, and they all felt part of the Gaither family.